Size of Male: 28-34 lbs., 16-17 in. Size of Female: 26-32 lbs., 15-16 in. The English Cocker Spaniel is one merry dog. You can easily distinguish the breed from the rest through its waggy little tail. Sociable with humans and other animals alike, the dog makes a wonderful companion for every home. The breed descended from Spanish progenitors and then belonged to one collective group of land spaniels. Today, when you mention Cocker Spaniel, you’re often understood to make reference to the English Cocker Spaniel, and not its American counterpart. The two used to be shown together before 1936. 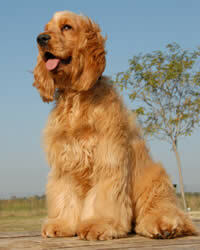 The Cocker Spaniel was recognized as a distinct breed a decade after. The breeders stayed vigilant against the idea of letting the English Cocker mate with other spaniel types. No pooch can manifest so much clinginess, friendliness and social graces as the English Cocker Spaniel. Clearly, the breed adores rounds of one-on-one attention so much that it will succumb to separation anxiety at the slightest hour you’re away from home. Excitable to the point of dribbling urine and barking at the slightest commotion, the dogs are peaceful creatures but they tend to be protective of their toys. Their vaguely dominant nature is manifested through nipping. Living Environment – Apartment life and a few minutes of leisurely rounds in your neighborhood aren’t enough for this dog breed. These pooches require at least a mid-sized yard where they can romp about. Needless to say, their clinginess for human companionship dictates that they sleep indoors with you. Grooming – There’s a lot that you must do to maintain your English Cocker’s looks. Their ears must be cleaned daily, their silky coat combed every other day and their hair clipped every other month. Do not neglect to trim the hair on the dog’s legs, tail and head. On the average, the breed could use quarterly professional grooming services. Diet & Exercise – English Cocker Spaniels can balloon easily, which is why you must serve them regulated low-fat and low-cholesterol diets. A good choice would be boneless poultry or beef mixed with fresh fruits and veggies. Experts suggest that you monitor the weight of your pet and adjust the food serving and frequency as needed. Most overweight dogs suffer from a lack of exercise and it’s no different with the English Cocker. These dogs require long walks and vigorous off-leash play to keep them in shape and in their best indoor behavior. When you’re heading outdoors, let your pet join your swimming escapade or hunting trip for an extra enjoyable treat. Health – If there are two things you should worry about in the English Cocker Spaniel, they will be the dog’s visual and auditory senses. Serious eye complications are quite common in the breed. Among the parti-colored pooches, deafness is also a major concern. Additional health risks include chronic heart and kidney diseases. This dog breed is a fast, highly trainable learner. Yet, there are a couple of things that will complicate the process and you must prepare for them. First, an English Cocker Spaniel can manipulate you if you allow it to. Second, it has a habit of barking at any new sight or sound. To control this behavior, you must invest in respect training early. Third, an unhappy dog cannot focus on the training. So, remember to shower your pet with attention and praise both in and out of training sessions.